If you are planning a prom limo rental in Woodbridge, let Platinum Party Bus Limos introduce you to dedicated party bus limousine fleet and service for the Woodbridge area and its surroundings. From prom limo rentals to wedding limo reservations and night out limousine services, we offer you with the chance to rent a luxurious limousine bus in Woodbridge for your night out experience. If you have many friends that will be attending the prom with you, and you require a larger limousine to get to and from the party safely, may we suggest to you reserving one of our many different party bus limos and luxurious limo buses. 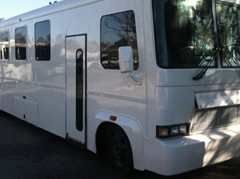 We have party bus fleet that can seat anywhere from 18 passengers comfortably to 26 passengers. If you are in need of something larger, than we have luxurious limousine buses that seat 30 – 50 passengers and you are treated to full out luxury with our larger limo buses. So if you are ready to rent a limo bus in Woodbridge for your prom or any other special occasion, look to Platinum Party Bus Limos today for all your party bus and limo bus needs.